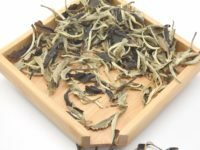 An affordable example of high-grown puer tea with a sweet flavor, thick aroma, and pleasing finish. The material for Black Stripe came from farmers who tend tea trees in the Bai Ying Mountain area. This sheng puer tea cake was pressed using only leaves from Bai Ying Mountain is in western Yunnan beside the Mekong (aka Lan Cang) River. The average elevation of tea gardens on Bai Ying Mountain is around 2800 meters; this is the highest known elevation in Yunnan for groups of tea trees to prosper in. The oldest trees in this area are approximately 100 old but there is much variation in both the age and variety of tea plants here. Tea producers often remark that sheng puer produced from high elevation areas has more sweetness, aroma and complexity in flavor. This is because tea trees or tea bushes grown at a high elevation are strongly impacted by shifts from higher to lower temperature between night and day. Research has shown that plants grown at high altitudes will develop additional catechin and amino acids, perhaps to aid in a bush’s survival under harsh conditions. These secondary metabolites translate into rich and interesting flavors in a processed tea. Black stripe is an excellent example of how the high-mountain growing can translate into the flavor of sheng puer. The young leaves of many tea plants on Bai Ying Shan have a purple hue but will become greener they grow. The tea for this cake was picked in mid-March while the leaves still had a hint of purple.